nation appears on page 5. 2Represents uninsulated, bare tinnned, and/or alloy coated wire. 5Beginning with the first quarter 1984 copper-base powder mill products will no longer be collected. 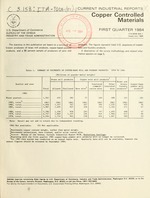 annual figures should be released by September 1984. For sale by the Superintendeat of Documents, U.S. Government Printing Office, Washington, D.C. 20402. 2For comparison of domestic manufacturers' shipment, export numbers, and import numbers for copper-base mill and foundry products, see table 4.
orogucts) are based on data for 1981 which are published in Origin of Exports of Manufactured Products, M81(AS)-5, appendix B.
SSource: Bureau of the Census report IM 145-X, U.S. Imports for Consumption and General Imports. SRepresents the c.i.f. (cost, insurance, and freight) value at the first port of entry in the United States plus U.S. import duties. 1The import and export numbers for this line do not include wire. small producers in order to represent 100 percent coverage. Approximately 80 companies are included in the mail panel. found in the January 1984 publication for this series. in an effort to minimize their influence. under toll agreements are included. are also included. All other intermediate shapes are excluded. finished shapes of copper controlled materials. DPAS-Defense Priorities and Allocations System. bility of the three sets of data. estimated, based on a 50-percent sample. narily, this type uf discrepancy is re iii.,- ,r in annual figures.